SSC CPO Recruitment Notification Released For 1223 Vacancies: Apply Now! Exams » SSC » SSC CPO Recruitment Notification Released For 1223 Vacancies: Apply Now! SSC CPO Recruitment 2018: The Staff Selection Commission (SSC) has released the SSC CPO recruitment notification for the year 2018 on 3rd March 2018 on the official website ssc.nic.in. The total number of vacancies for the various posts of SSC CPO is around 1223 (tentative). The SSC conducts the SSC CPO exam every year for posts of Sub Inspector (SI) and Assistant Sub Inspector (ASI) in various Central Police Organizations (CPOs) like Delhi Police, CRPF, CAPF, ITBP, CISF, etc. 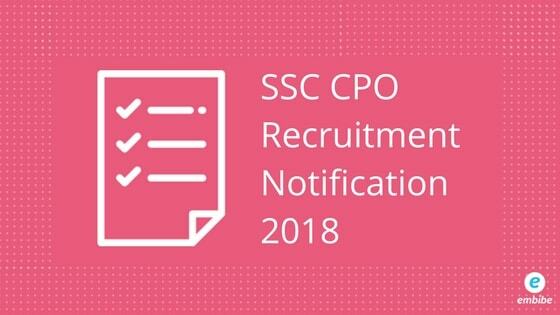 In this article, we will give detailed information about SSC CPO recruitment 2018 – important dates, eligibility criteria, exam pattern, application form, syllabus, etc. Read on to find out. Name of the Force Category UR OBC SC ST Total Ex-Ser. Nationality A candidate must be a citizen of India / a subject of Nepal / a subject of Bhutan / a Tibetan refugee who came over to India, before the 1st January, 1962 with the intention of permanently settling in India / a person of Indian origin who has migrated from Pakistan, Burma, Sri Lanka, East African Countries of Kenya, Uganda, the United Republic of Tanzania (Formerly Tanganyika and Zanzibar), Zambia, Malawi, Zaire, Ethiopia and Vietnam with the intention of permanently settling in India. Age According to the SSC CPO recruitment notification 2018, candidates who are 20 to 25 years old can apply for the exam. SC/ST candidates have an age relaxation of 5 years while OBC candidates have an age relaxation of 3 years. Ex-Servicemen have an age relaxation of 3 years. Educational Qualification As per the SSC CPO recruitment notification 2018, candidates must have a Bachelor’s degree from a recognized university or equivalent. However, if you have not acquired the degree as on 01-08-2018, you are not eligible and need not apply. Note: Male candidates applying for the post of SI in Delhi Police must possess a valid Driving License for LMV (Motorcycle and Car) on the date fixed for Physical Endurance and Measurement Tests. However, for all other posts, candidates who do not have a Valid Driving License for LMV (Motorcycle and Car) are eligible. Both Paper I and Paper II are of 2 hours duration. Note: For right-handed candidates, the right eye is better eye and vice versa. Step 1 Go to the official link to apply online. Step 2 Read the instructions and then enter the basic information asked to register yourself. Once registered, you will be provided with Registration ID and Password. Note them down in a safe place. Step 3 Upload the scanned copies of Photograph and Signature in JPEG/JPG format. The size of the photograph should be between 4 KB and 20 KB. The size of the signature should be between 1 KB and 12 KB. Step 4 Enter the required details in the online application form carefully. Step 5 Make payment of SSC CPO application fee and submit your application. Step 6 Take a print out of the same for future reference. According to the SSC CPO recruitment notification 2018, the application fee can be paid online (Credit card / Debit card / Net banking) or through SBI e-Challan. SSC CPO Admit Card / Hall Ticket will be issued on the official website. SSC CPO is a highly competitive exam. In order to crack this exam, you must be well-prepared and be in a position to score as high as possible. Taking banking mock tests can help you a lot in this exam as the syllabus is more or less same. You can take the mock tests available on Embibe for free. We hope this detailed article on SSC CPO recruitment 2018 helps you. In case you have a query regarding SSC CPO recruitment, reach us through the comment section below and we will get back to you.